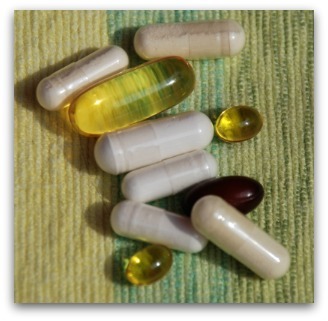 Not everyone thinks that taking vitamins and supplements makes a difference in their health. Some claim it all just becomes expensive "pee". I happen to believe that supplementation is a good idea. We can just agree to disagree. Please consult with your healthcare practitioner before adding vitamins and supplements to your diet. Some of these can produce interactions with prescription medications, so talk to your doctor. I do get asked what vitamins I take so here's my list and why I believe I need to take them. The doses are what work for me and are typically what is recommended on the product label. Because I take a handful, I split them up taking some in the morning and some in the evening. If I am doing a water only fast, I will skip the vitamins and supplements, except for the magnesium. Magnesium is a very important mineral with over three hundred different enzymes in the body counting on it. Unfortunately most people don't get enough. And that's bad news for your heart. For me it has helped with a sometimes irregular heart beat. And I think it's assisted me in getting off blood pressure medications... so has a forty pound weight loss! Magnesium helps with asthma, migraines, fibromyalgia, PMS, insomnia, muscle cramping and much more. Taking too much magnesium will cause diarrhea. The dose I take doesn't cause me any issues at all. With enough direct exposure to sunlight, your skin manufactures vitamin D naturally. Those of us who live in the Northern Hemisphere don't get nearly enough exposure to the sun. Nor do people who spend all their time in an office or those who work night shifts who need to sleep during the day. If you're covered in sunscreen you also don't get enough exposure. For me, taking Vitamin D has helped with my energy levels. Some years ago I was so low in Vitamin D that my doctor had me taking 3000 IU daily for a period of time and then he said to take 2000 IU daily for the rest of my life. So that's what I do. As I've learned since then, Vit D helps with calcium absorption, therefore bones benefit from this vitamin. It also contributes to lowering blood pressure. The importance of Omega-3s is well-known. Omega 3 is great for supporting heart health, lowering triglycerides, preventing blood clots from forming, keeping your heart rhythm regular, normalizing blood pressure, treating established cancer, helping with arthritis and other joint pains, and much more. In nature, vitamins B1, B2, B3, B6, folic acid, B12 and pantothenic acid exist together. By taking B Complex I'm getting my B vitamins all in one. Just like nature intended. Although each vitamin has its own role to play, overall the B Complex helps to convert fats, proteins and carbohydrates from our food. I take it because my doctor suggested it. It helps with blood pressure, keeps your heart healthy, assists in normalizing blood sugar /diabetes and seems to help treat cancer. Reduces the risk of cardiovascular disease and it lowers blood pressure. I love to eat garlic but for therapeutic results I like to use the supplements... people around me are probably grateful too! Either one will keep my microbiome and gut health in tip top condition! Pssst.... I do love the kefir best!! I take this daily for help with my middle age skin. I'm told I have great skin!, so it must be working. Actually I'm blessed with both my parents having very youthful appearances... but I take the collagen just for insurance! · If you think you need to take vitamins and supplements talk with your doctor first. OK, all done with fasting journal 9. Let's see what tomorrow brings!